Wired or wireless home security cameras? It’s a question that leaves a lot of consumers befuddled. The difficult part is that each type has its pros and cons. Which one is right for you and your home is something that only you can decide. With the help of this article your decision will become a lot easier and less overwhelming. We’ll start by looking at the major pros and cons for each system. We will then review the lesser points, which are still things you may want to factor into your decision making. The initial advantages for wireless home security cameras are obvious. The main benefit is cost and convenience. You can position them just about anywhere you please straight out of the box. You can also move them around if you want to, without losing your connection. There’s also no drilling or other DIY involvement unless you choose to. That means no electricians to pay or fixed wires running along the walls. Based on this ultimate flexibility, you might question why there’s still a demand for wired home security cameras. Keep reading to find out. If something sounds too good to be true then it probably is. Wireless cameras are not normally totally wireless because nearly all WiFi security cameras need constant power so there has to be a cable from it into the power outlet. You can get battery powered cameras but the batteries don’t last very long. The most common disadvantage for the camera is Wi-Fi or radio interference. This is something that a passing ambulance or police car can trigger. It’s even possible for a neighbor’s network to affect your own wireless connection, along with a few other things (you can read more about radio interference here). Some systems are easy to set up, but there are others that can prove quite difficult, especially for those who are not tech savvy. Potential technicalities include pairing devices, passwords and firewalls. If you have a multi-camera setup it will take up some bandwidth. If you have 4 WiFi cameras then you will require an internet speed of about 10Mbps. If you have an 18 camera system, which I guess very few people will, then you will require an internet speed of about 35Mbps. You can check your speed here speedtest.net. These disadvantages won’t apply to all systems in all homes; it all depends on what you have and your individual setup. And finally, there is the reliability issue. Wireless cameras have come a long way in recent years, and on the whole they’re impressive. Despite this, they’re still not as robust or as reliable as wired systems. This is why I would only use wireless cameras for indoor use. Setting up wired home security cameras is great if your property is a new construction where Ethernet cables are already wired in or the walls are still open, or during renovations to an older property. They’re generally less expensive than wireless systems and provide you with better quality viewing. Wired cameras don’t affect network’s speeds either. It’s worth noting that you only need one cable, the Ethernet cable, because the power can be supplied from the Ethernet cable, these cameras are called POE (Power Over Ethernet) cameras. So if you did want to move them around, you would just have to move them to somewhere near another Ethernet plug socket. Messy cables! If you’re not moving into a brand new property or not about to renovate your home, you have to prepare for unsightly cables, unless you chase them into the walls. And the more cameras you have, the more Ethernet cables there will be. Once you have the wired home security cameras in place, they’re not as easy to move around, unlike the wireless options. Wireless transmission also can eat up a lot of power, especially HD and night vision. Worth noting too is that wireless video can be a little choppy. There’s also a bit of lag time. What this means is that the time of the actual event and the time you see it on the screen has a delay. This delay can be from 2-5 seconds depending on the system and the setup. The clarity of wireless systems is not as good as wired cameras. Depending on your location and local environment, there may be all kinds of things that could potentially interfere with your transmission. Even mirrors close by can have an effect on a wireless video transmission. It’s certainly something to think about. 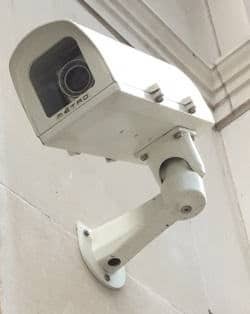 Some wireless security camera systems work perfectly well in certain locations, but others will suffer from the disadvantages mentioned. It’s for these reasons that wireless technology doesn’t dominate the outdoor home security camera market yet. Remember, wired cameras are better quality, have no lag, are more reliable, and cheaper to buy . I believe the best advice is to opt for outdoor wired home security cameras and wireless for indoor use. I have prepared two special review pages which explore six of the best home security camera systems. I have selected three for outdoors and three for indoors. After reviewing many of the popular systems, these were by far the best picks. Despite the setbacks and potential disadvantages to wireless home security camera systems, people still prefer them over the hard wired options. This is a trend that is set to continue. In other words, the pros of wireless outweigh the cons for the majority of folks. This is why I focus mostly on what people want, and it’s why I write and review more on wireless technology than wired.